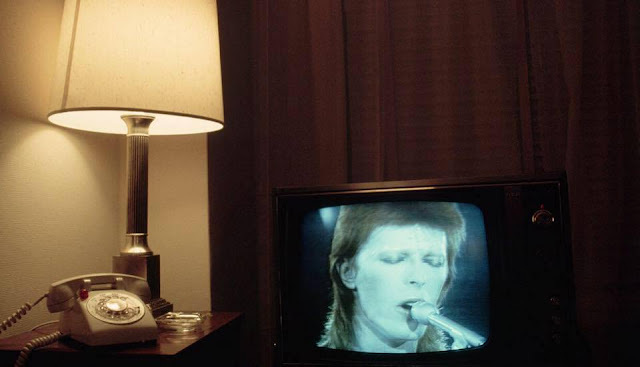 1974, New York — David Bowie performs as Ziggy Stardust on TV in a room at the Delmonico Hotel. News of his passing has totally winded me, in an unexpected way. Unexpected in knowing that yeah, we're all gonna go- I mean, I felt this way when Lou Reed died...but really? Now? It's an uneasy feeling like we all have to take it from here. I was in the throes of insomnia when I got the breaking news at 2:30 or so in the morning, so my exhausted body nearly collapsed into bereaved tears when I heard "The Prettiest Star" suddenly come up on my way to work this morning. It was just that second of realizing "Oh yeah, Marc Bolan plays this beautiful, melancholy guitar riff. Marc Bolan is dead... Jesus, David Bowie is dead." I listened to his newest album "Backstar," which he just released this past Friday on his 69th birthday, on my way in to work this morning.